Photo from previous Bike Night. For the past month we’ve been celebrating bicycles all around Los Angeles County – there have been group rides, workshops, community-hosted events and more. 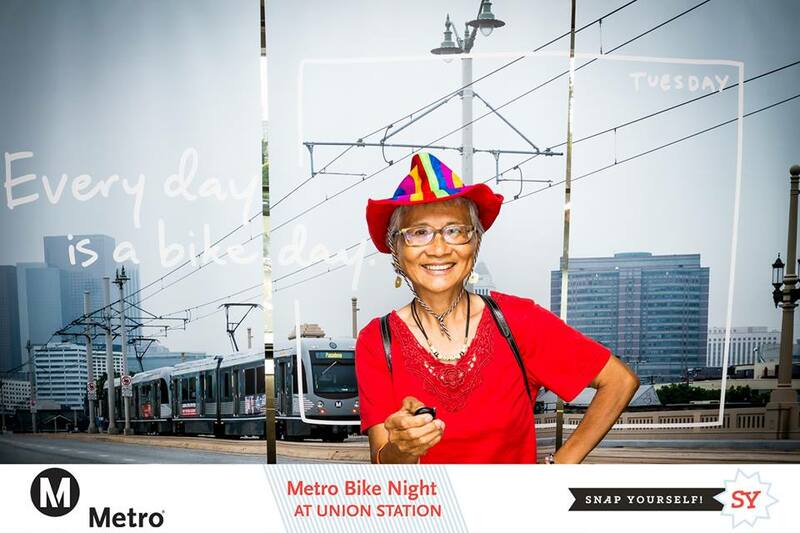 And now we’re wrapping Bike Month with the biggest bike party of the month: Bike Night at Union Station on Friday, May 26. The festivities will take place from 5:30 to 8:30 p.m. and it’s free to all ages. Music will be provided by Metro Art + DJ Garth Trinidad of KCRW, and there will be food trucks selling refreshments. Other activities include a kids’ bike rodeo provided by the Walk n’ Rollers, a helmet decorating station by CicLAvia, and and arts and crafts area provided by Side Street Projects. There will also be booths where you can pick up information and fun prizes from Metro Bike Share, Metro Bike Hub and Open Streets. You can reach Union Station via the Gold, Red, Purple or Silver Line. There’s also a Metro Bike Share station on the west end of Union Station near Alameda Street. If you haven’t tried Metro Bike yet, there’s still time to sign up for a free Metro Bike Share monthly pass. For those coming on their own bicycles, there will be a complimentary bike valet on site.